Values-based investing starts with commitment. Our dedication to providing values-based investment solutions has been unwavering. 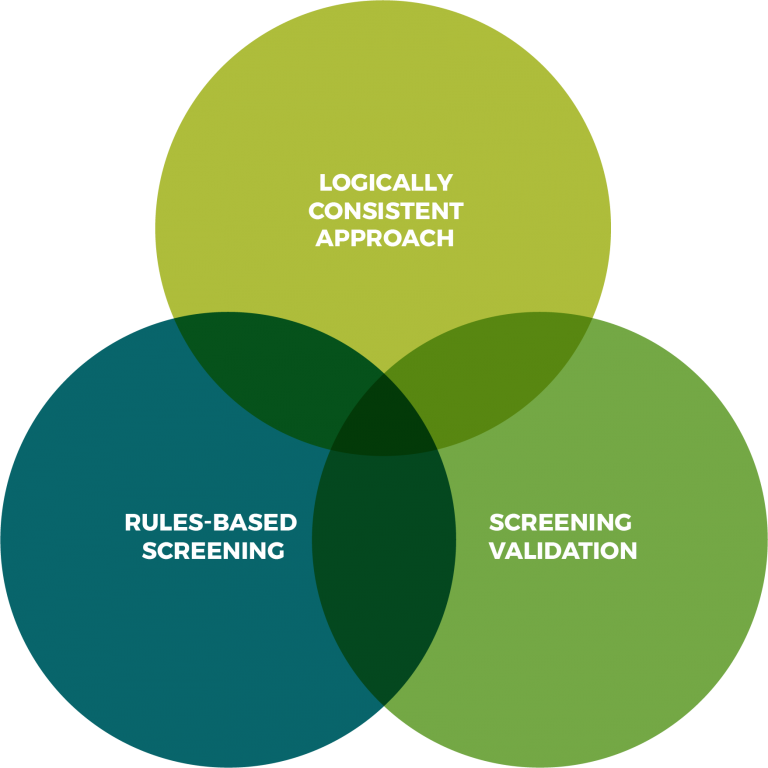 Our proprietary screening methodology goes beyond the basic analysis of widely available quantitative industry data, and includes insightful fundamental research. We provide investment options across a broad range of asset classes using both separately managed accounts and mutual funds. Our focus is to provide outcome-oriented solutions for investors seeking Income, Income & Capital Appreciation, or Capital Appreciation. Crossmark’s Core Fixed Income portfolios offer investors intermediate-maturity, government, agency, and investment-grade corporate bonds. Our active fixed-income approach is premised on the belief that superior long-term returns can be achieved with less-than-market risk by focusing on high quality securities. We add value through active duration management and the selective rotation of market sectors and the securities within those sectors. These strategies are available through separately managed accounts as well as the Crossmark Steward Funds. Crossmark’s Fixed Intermediate portfolios seek to provide capital preservation, current income and capital appreciation. The strategy allocates assets to U.S. Treasuries, agencies, investment grade corporate bonds and mortgage-backed bonds. These securities have maturities of 10 years or less to reduce interest rate sensitivity and volatility. We add value through active duration management and the selective rotation of market sectors and the securities within those sectors. Crossmark’s Current Income portfolios seek to optimize a multi-sector fixed income strategy for income. Clients invest in an investment grade fixed income portfolio seeking the higher levels of interest and dividend income, while maintaining a conservative intermediate duration. Crossmark designs Current Income portfolios for investors primarily seeking higher absolute returns associated with liquid, intermediate-term, U.S. Fixed Income Securities. Crossmark’s Income Opportunities portfolios are managed accounts designed for the investor who is focused on maximizing income generation from their portfolio via investment in multiple sectors. We invest in a myriad of sectors including investment-grade and high yield corporate bonds, preferred stocks, common stocks, U.S. Treasuries and international bonds. This strategy strategically targets the asset types that offer enhanced income over a straight bond portfolio. Crossmark’s Municipal Fixed Income portfolios are structured portfolios consisting of “A” or higher rated bonds (at time of purchase) as rated by either Moody’s or S&P. Our municipal bond investments focus on essential services and general obligations with short-to-intermediate-term maturity. By emphasizing bond characteristics and overall structure, we attempt to maximize the portfolio’s current (coupon) income and taxable equivalent yields. Crossmark’s access to institutional market relationships provides an opportunity to select from a diverse inventory of municipal bonds at competitive prices, enabling us to efficiently manage portfolios. The Crossmark Steward Select Bond Fund seeks to provide high current income with capital appreciation and growth of income. The Fund implements an active investment approach and invests in various fixed income sectors including investment-grade corporates, mortgage backed securities, U.S. Treasury and Agencies. Investments are screened in accordance with the Fund’s cultural values policies and those companies failing to meet the criteria are removed from investment consideration. Crossmark’s Covered Call Income portfolio seeks to generate high dividend income with capital appreciation potential. The strategy employs a “buy-write” strategy, also called a “covered call” strategy, in which we buy a stock or a basket of stocks and write (or sell) call options that cover the stock position. The strategy can enhance portfolio returns under certain market conditions and reduce volatility. In down markets, the option premium received cushions the price decline in an equity portfolio. The trade-off is that in strong equity markets, the upside potential of the equity investment is limited. This approach is appropriate for investors looking for current income, capital appreciation potential, and a diversified equity portfolio. Crossmark’s Global Equity Income portfolios offer income and long-term capital appreciation by investing in global (domestic and international) dividend paying stocks. The strategy utilizes a hybrid quantitative investment methodology combined with a relative risk-controlled portfolio. This process creates a portfolio of dividend paying stocks with high and growing dividend income, while providing exposure to both U.S. and international markets. These strategies are available through separately managed accounts as well as the Crossmark Steward Funds. Crossmark’s Balanced Core portfolios combine our Large Cap Core Growth and Fixed Income strategies to form a portfolio of both stocks and bonds. This strategy seeks to provide a balance of growth and income through its asset allocations. The allocation ranges are customizable between 40% and 60% stocks and bonds in order to fit an individual needs. Crossmark’s Israel Impact portfolios utilize a domestic equity strategy built to provide a large cap index investment-like experience while only purchasing those companies which actively contribute and participate in Israel’s economy. The levels of participation include financial investments, strategic investments, cooperation and other criteria. The strategy utilizes an optimization investment process in order to create a risk-controlled portfolio. The Israel Impact portfolio creates an opportunity for investors to not only exclude companies who violate the Israeli anti-embargo agreement, but to stand with Israel by investing in those companies that have a direct, positive impact on the economic growth and stability of the country. Crossmark’s Large Cap Core Growth Equity portfolios offer investors high quality, large capitalization growth stocks. Our disciplined, bottom-up approach, which combines objective, quantitative analysis with subjective stock evaluation, seeks to provide above average long-term growth in our clients’ portfolios, while at the same time explicitly controlling for portfolio risk. This universe is screened using several measures which fall under five basic criteria as follows: free cash flow, rising earnings estimates, quality of earnings, relative strength and stock valuation. These strategies are available through separately managed accounts as well as the Crossmark Steward Funds.